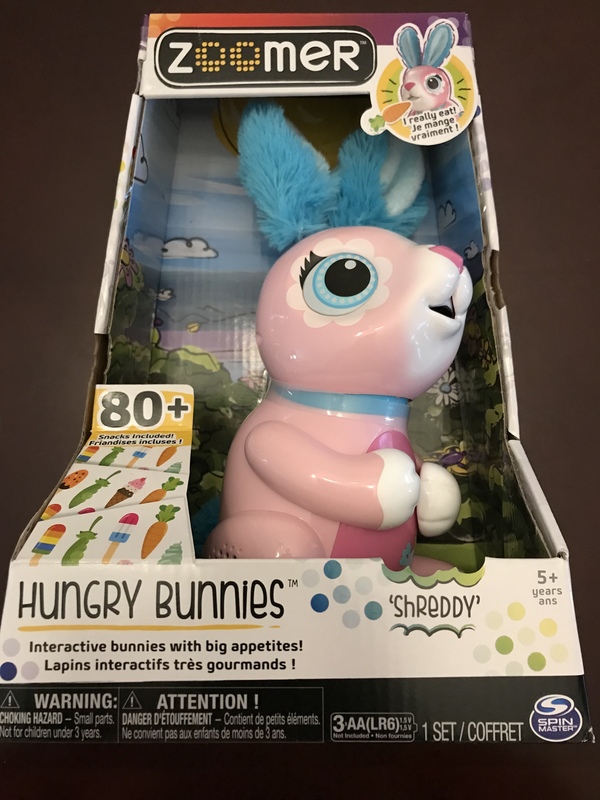 Nom, nom, nom, the Hungry Bunnies Chewy & Shreddy are here! Adopt a fluffy-eared Hungry Bunny and feed it delicious treats! Always ready for food, Hungry Bunnies eat all their snacks – just like real bunnies! To feed your bunny, hold up one of the colorful paper treats to their mouth. Your adorable rabbit will munch, munch, munch, until their treat is all gone! With over 80 treats to choose from, you can feed your real pet a balanced diet of carrots, popsicles, ice cream and more. Store all your Hungry Bunny’s food in the cute snack basket (included)! You can even make your own delicious treats using the treat tracer (included) and a sheet of paper! After a full meal, your Hungry Bunny will poop a colorful confetti surprise! Once you’ve fed your Hungry Bunny, play a magical music game. Your new pet loves to sing! 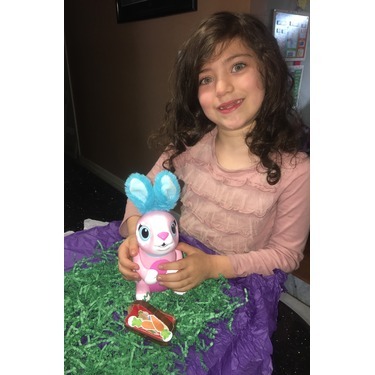 In fact, the only thing your bunny loves more than eating and singing is laughing! Tickle their stomach to hear cute bunny giggles! From floppy ears to fuzzy little tail, these colorful bunnies make adorable pets! 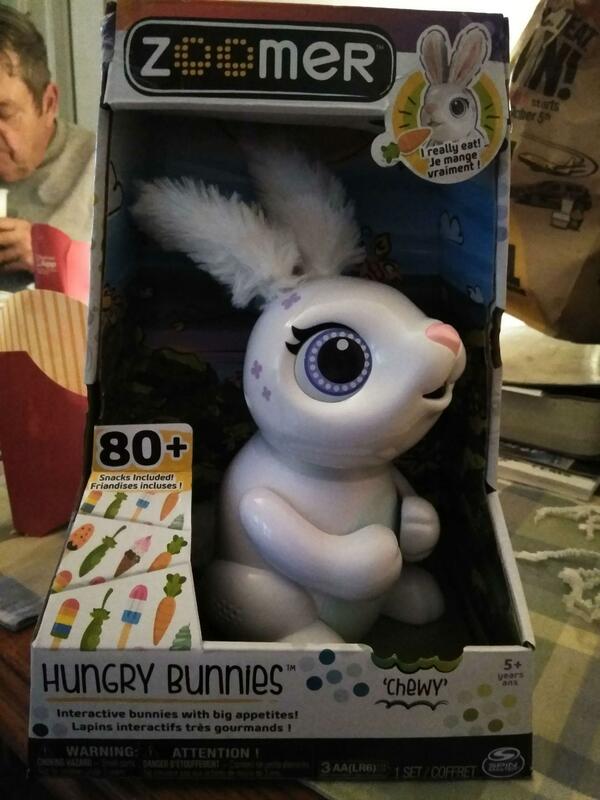 Bring home your own Hungry Bunny for nom, nom, nom fun! 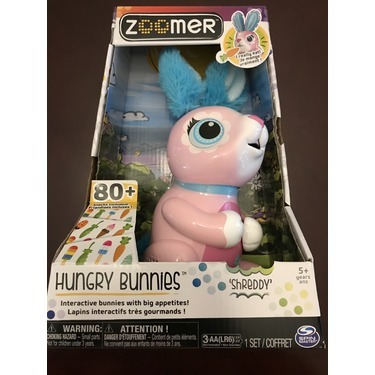 Zoomer hungry bunny is a wonderful toy for kids.My daughter loves playing with it and keeps her busy .Feeding the bunny and seeing it poops makes her very happy. 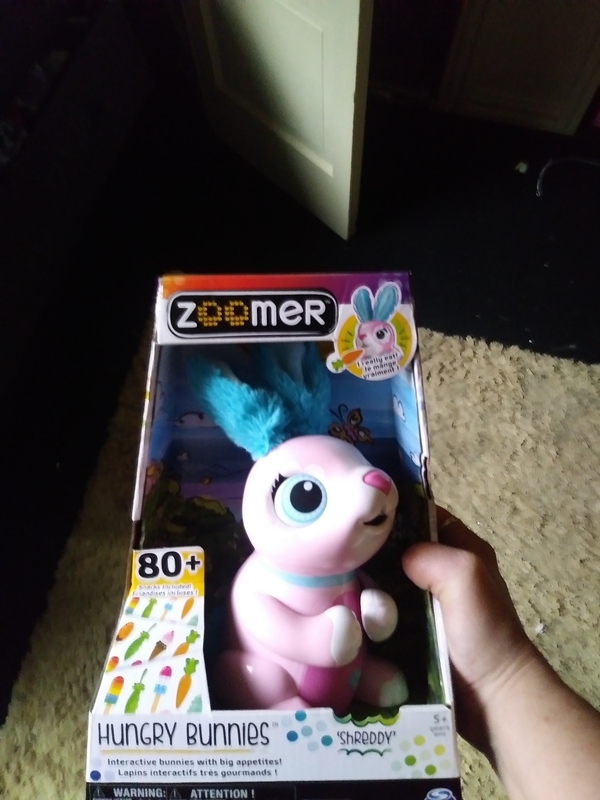 I received this zoomer interactive toy for free from the family rated club. It is absolutely high end product with great features. 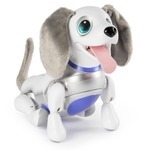 You have to add batteries and change them out every few weeks to keep the toy working right. 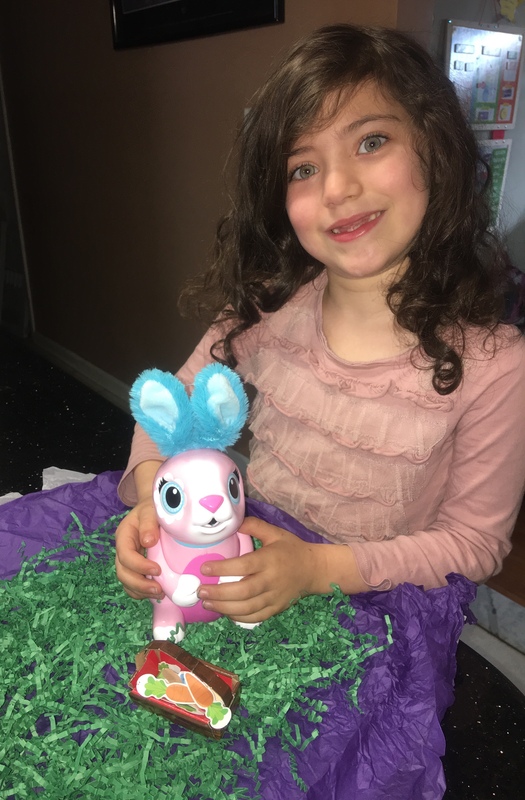 Its very interactive to play with and the kids enjoyed feeding the bunny and watching it chomp and shred the food out its tail. Its great for the whole family. 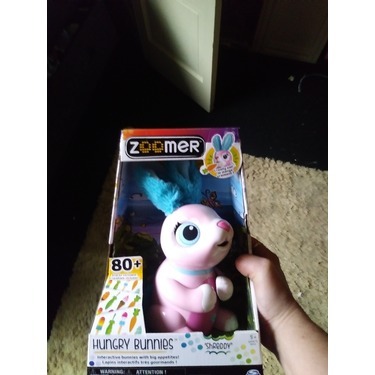 I received the zoomer bunny rabbit for free through the mail. My son seen it and was playing with it before his sister came home from school, he gets home from kindergarten before her. He loves the sounds it makes and just giggles the whole time, he is still a little young to understand what or why it’s making the noises and that is fine by me as long as it’s keeping him entertained! His sister is anxiously waiting for him to become bored with it so she could try feeding it. 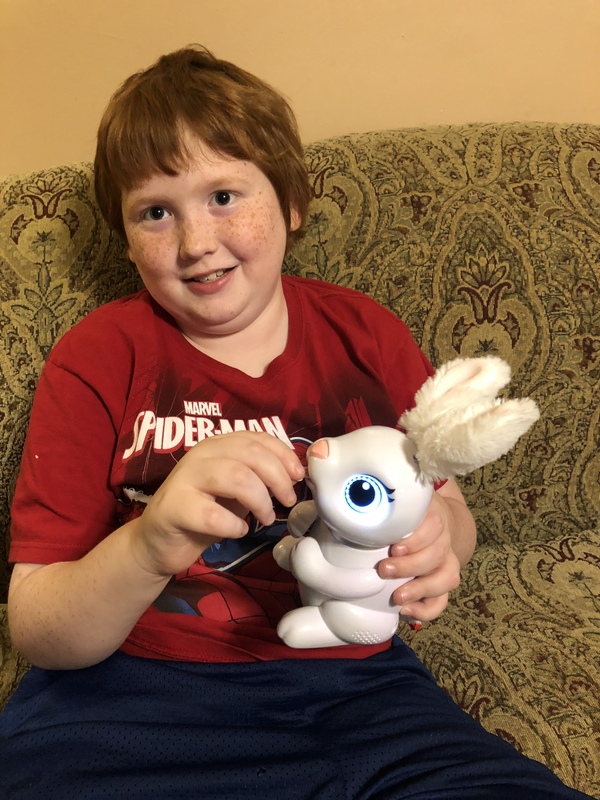 My ten year old absolutely loves this bunny. I think it may have been more geared toward girls, but he seems to really enjoy it. Although, one negative is that it doesn't hold his attention all that long. It is made of a nice thick plastic and is super cute. Comes with a carrot, some treat papers, a basket to hold those in, and it's instructions. You feed the bunny the paper treat, it eats it, then poops it out. Which is cute, but it is essentially a paper shredder. 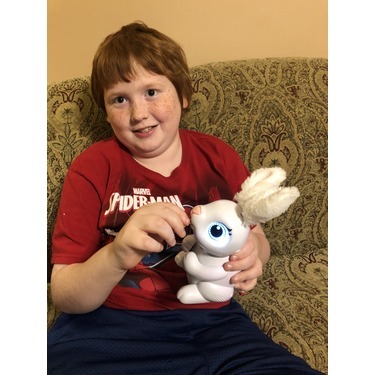 Well made toy, easy concept to understand. It's very visually appealing and all kids think poop is funny so I think as far as it's purpose, it does a very good job. I received this toy for free in exchange for my honest opinion. 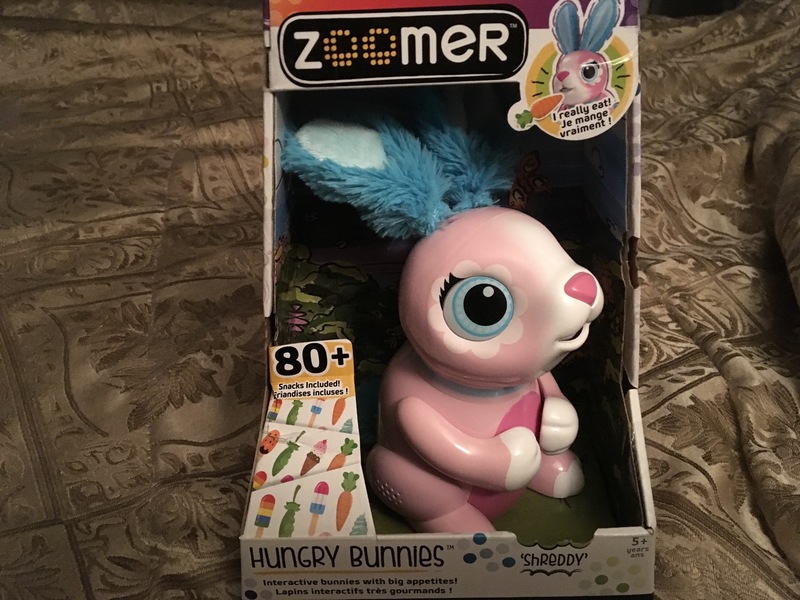 My kids loved this zoomed toy especially it eating the little stuff that came with it! Was super easy to put together and so cute. 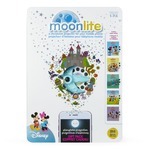 Very good entertaining for kids under 6. 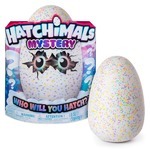 My kids were playing with this for hours! Would recommend this to anyone that loves interactive play! I recieved this free for review purposes. This is a fun toy! 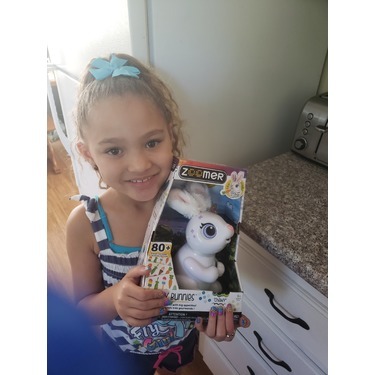 Upon receiving the package, my daughter instantly fell in love with this adorable rabbit. She had hours of fun feeding it, and taking care of it. 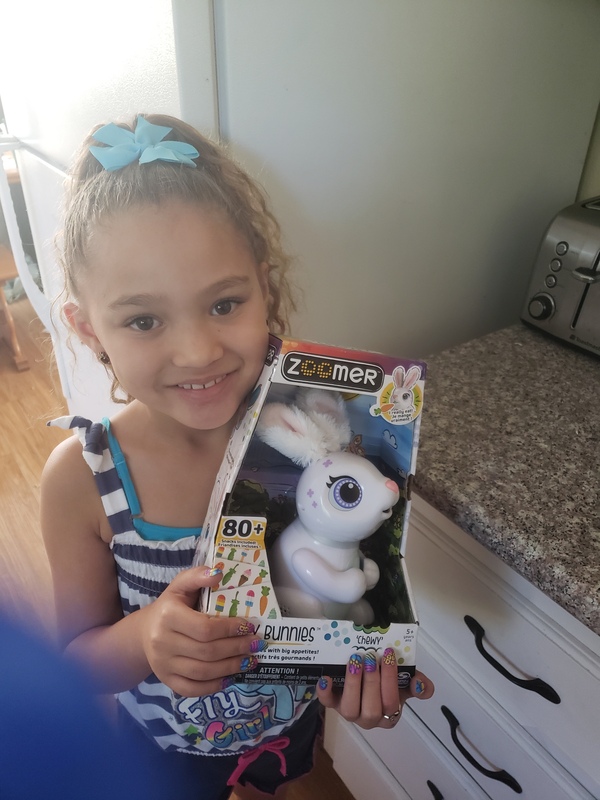 She really loves the fact that she can feed the rabbit and it really eats it! I highly recommend this toy! 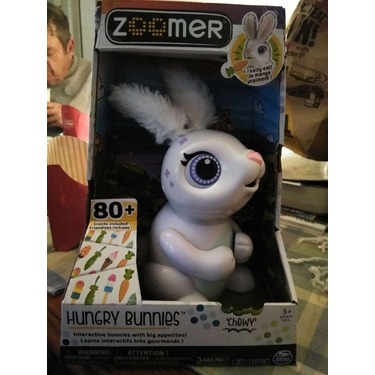 This interactive Zoomer Hungry Bunny is fun and entertaining! Comes with sheets of food to feed the bunny right away and includes a tracer page to make more carrots. It "poops" out the paper right after eating it. There is a tube that runs from the mouth to the little tail. 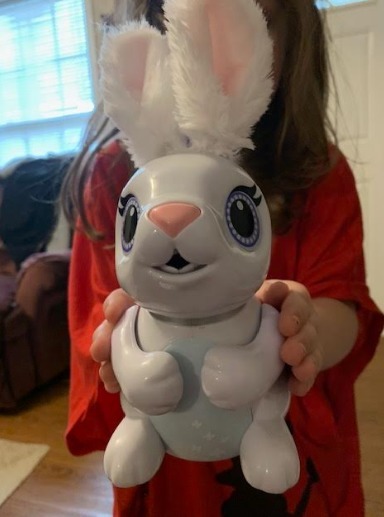 The bunny makes noises, also has a game you play with it. 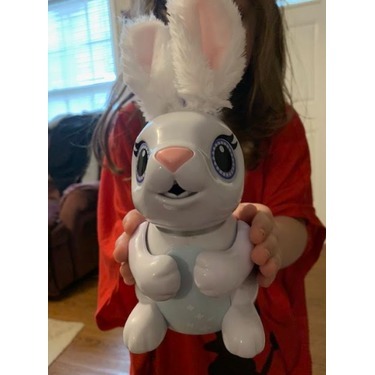 This bunny is just absolutely cute and keeps you entertained for hours, it will my son! He just loves playing with this bunny. I would recommend this to others. 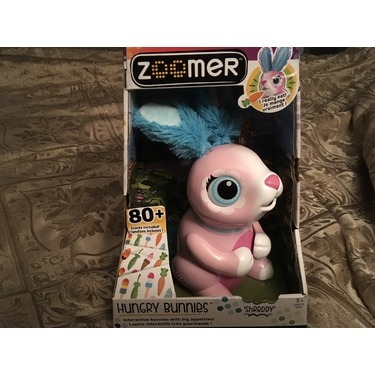 The Zoomer Hungry Bunny is so cute. 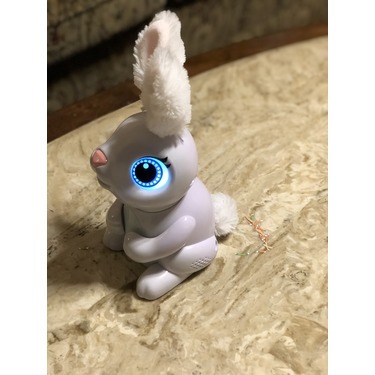 This cute bunny makes sounds when you rub it’s nose, head and belly. 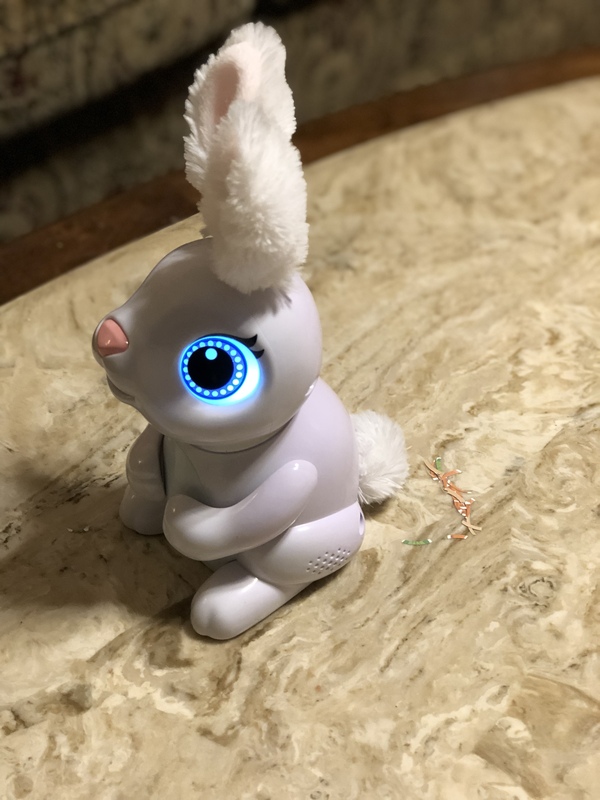 The eyes light up and ears, arm and tail move. You feed it paper snacks, and makes cute sounds while munching and it poops shredded paper. It comes with a stencil to make more snacks. My children lost interest after about 5 minutes. It’s cute but I do not know if they will play with it again.